Sounds like a blast! You look adorable with your red shoes, too. You look great. I've never heard of the game. I'll have to look into it. see I knew you could write this so elrquent! I am going to copy yours into my journal as well. we really had the best time. 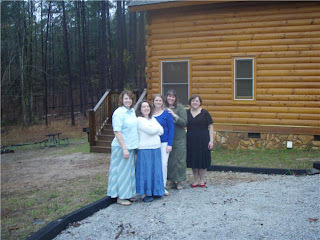 I can't wait until we do it again and we are the Fabulous Fantastic Five. wait a minute, i wasn't the only motor mouth on the retreat! mrs. tina did just as much talking in the night, she was just upstairs and a bit harder to hear in her hot rainbow room! AWESOME black dress with red shoes. There is nothing frumpy about red shoes. I forgot the most important question: Did you bring your Snuggly? Nope, didn't bring the Snuggie, but I was wishing I had. It was a rare cold weekend here. Sounds like so much fun! Girls weekends are so needed in every stay at home mom's life. Good for you guys. I totally need to check out that game, I love boardgames! Sounds like you had so much fun! I'm due for a weekend away. Anyone want to join me? 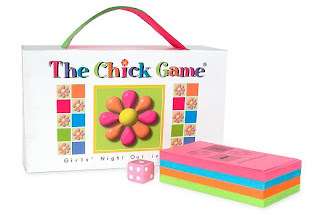 The company that made The Chick Game went out of business in December, but I bet if you check e-bay or craigslist you might be able to get your hands on one.